MUTARE, Zimbabwe, Mar 1 2016 (IPS) - Silindiwe Moyana, an HIV positive mother of five from Chipinge east of Zimbabwe, cannot hide her anxiety. She was worried she might not survive this year as drought-induced starvation stalks her and her family. The country is in the throes of a devastating drought which has compromised the nutrition of people living with HIV. With an estimated 1.2 million HIV positive people, Zimbabwe is one of the countries in Africa heavily burdened by this pandemic. The country has historically had one of the highest HIV/AIDS rates in the world, but has been commended in recent years for its success in reducing infection rates. Nutrition is very important for people who are taking anti-retroviral drugs, but we have no food. We are facing serious challenges. Up to 2.4 million people in the country are food insecure this year, according to figures released by the government in February this year. 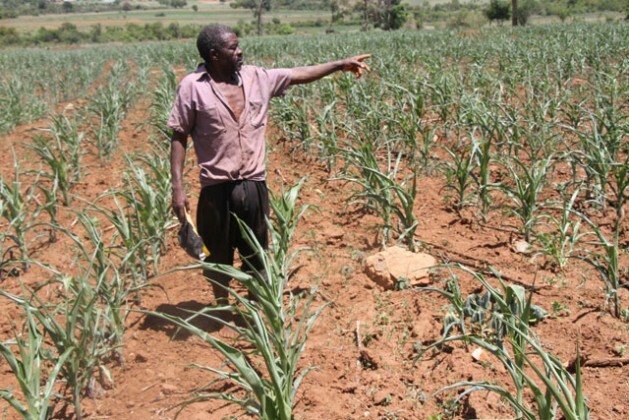 The Zimbabwe National Network for People Living with HIV/Aids coordinator for Manicaland province, Lloyd Dembure said the current drought had affected a large number of people living with HIV. Health experts say if one defaults on HIV treatment, the virus mutates and becomes resistant to drugs being taken. “We are urgently calling for food relief to people living with HIV,” Dembure said. He said the situation has been compounded by the HIV and TB core-infections. And many people living with HIV are also taking TB drugs. “These drugs are powerful and need good nutrition,” he emphasised. Casper Pound, an HIV positive man living in the eastern border city of Mutare, said a lot of people living with the virus were suffering as a result of the drought. “People living with HIV are going through a tough as far as nutrition is concerned. It becomes difficulty to take medication on an empty stomach,” said Pound, who also heads an HIV/Aids pressure group, Family Aids Support Organisation. According to Zimbabwe’s National Aids Council (NAC) more than 60, 000 people succumb to AIDS each year. And at 15 per cent, Zimbabwe has among the highest rates of HIV prevalence in Africa. In absolute numbers, more than 1.3 million people are living with it. The free anti-retroviral therapy programme in Zimbabwe started over a decade ago with the objective of reducing morbidity and mortality due to HIV and AIDS and improving the quality of people living with it. At least 618, 000 adults living with HIV were on anti-retroviral therapy while 46 000 children were on the same programme by December 2014. But NAC’s spokesperson, Tadiwa Pfupa, argued it was not the duty of the council to provide food supplements to people living with HIV: “There are other government departments responsible for that (giving supplementary feeding to HIV people),” he said. However, report by the Food and Agriculture Organisation (http://www.fao.org/docrep/004/y5128e/y5128e03.htm), HIV/Aids and nutrition were intimately linked. “Poor nutrition can damage the immune system and contribute to the acceleration of full-blown Aids,” the report said. An adequate, well-balanced diet is therefore an essential component of basic care for people living with HIV/Aids. “Given the lack of medical care and drug treatment in most AIDS affected developing countries, it is imperative that vigorous efforts to achieve and maintain good nutrition among HIV-infected people are undertaken as a matter of priority,” the report added. And in an effort to avert catastrophe, the government has acquired 650,000 tonnes of maize (a staple in Zimbabwe) from Zambia and Ukraine for national consumption. The maize was acquired at a cost of US$200 million.